Ad Novum | Whether beginning a universe or thursday dinner, things can get a little messy…. This magazine is filled with fantastic recipes. They are interesting. They are easy. And they are delicious. We’ve made the Japanese fried chicken, the Broccoli pasta (you make a sauce from the stems!) and countless others. We’ve have not been disappointed yet. There is a fair amount of controversy around it’s production. Christopher Kimball left America’s Test Kitchen before his contract was up and is embroiled in some lawsuits because of it. But, hey, who’s to say we can’t enjoy some great recipes in the meantime? There are also lots of interesting articles from different parts of the world. And did I mention delicious recipes? So I mentioned in my post Bulgur: The Epically Delicious Grain that Mirepoix, the mixture of chopped onions, celery and carrot used as a base for French soups and sauces, had an interesting history. First off, I should mention that a lot of cultures have their own versions of a soup/sauce base, depending on what vegetables are regionally available. In Germany, for example, it is called suppengrün which literally means ‘soup greens’ and consists of a leek, a carrot and a piece of celeriac. What’s particular about Mirepoix is the name. As in it is an actual name of a person, not a term to describe what it is in essence. He was a French Aristocrat with so many names that I chose to copy and paste it rather than type it out. Let’s be real, I have a baby sleeping on one arm… Charles-Pierre-Gaston François de Lévis, duc de Lévis-Mirepoix. Holy Aristocracy that’s a lot of names! I don’t feel so bad about my kids’ names, now. Even better, he isn’t the one who actually invented or used a mirepoix. I don’t know what French Aristocrats did with their time; hunt? contemplate cheese? powder their wigs? But I do know it wasn’t cooking. His chef did that. Whose name is lost to history while Mirepoix is too cemented to the vegetable base for it to make any difference at this point. So there’s history for you; in spite of being described as an ‘incompetent and mediocre individual‘ Mirepoix has become the pathway and maybe even the gate guard to delicious soups and sauces. Go figure. How is it 2017 and chocolate is only now being recognized as an official snack item? This is ridiculous. I’ve known since the first time I tasted it. I am, of course, speaking of Barkthins. Is this bag empty? Is it any of your business? All I know is that that Barkthins told me I was sophisticated and even mindful for eating them. So there. I was REALLY sophisticated and mindful this week. SO much so that I’ll need to be placing another order on Amazon soon. I personally love the pumpkin seed flavor and the almond flavor. But there are others to try. It’s good to have things to look forward to. You have met bulgur before. It was probably dressed in Tabouli. But it’s got a lot more to offer – after 4000 years of being cultivated – it’s been around the block. Bulgur means “bruised grain” and it has to do with the way it is processed. The wheat is boiled or parboiled, dried out in the sun (at least traditionally) and then smashed into bits and stored for later use. Maybe it was an ancient method for dealing with anger? Who knows? In any event, they are delicious little nuggets that absorb flavors like little champs or taste delicious with just a little olive oil and salt. Bulgur can be used as a side dish, a breakfast cereal, it can replace pasta in soups, rice in stir frys, and the list goes on. Bulgar is basically my hero. It’s been a while – like FIVE YEARS (!) since I posted last. I’ve been a little busy – had two more kids, for a grand total of three – which means that our whole house looks like the header image on this blog and there isn’t as much time for testing recipes and taking pretty pictures. That’s not to say that I haven’t done it. I like taking pictures of food. It’s like a yummy memory. I’ll have to go back and find those and recreate them. Anyhow, that’s where I’ve been in a nutshell, or I guess I WAS the nutshell and they were the nuts…which makes a lot of sense as an analogy…..
Back to bulgur. We’ve been making bulgur for years now, but I can’t recall exactly when we realized the importance of incorporating it into our life. Even just now, we reheated the recipe I’m about to share and threw an over easy egg on top. Et Voila! : Delicious and filling breakfast. My husband loves to eat plain bulgur with over easy eggs and turmuric sprinkled on top. After many iterations – I think my husband came up with the exact ratio of water to bulgur that resulted in fluffy, perfectly cooked bulgur. But the truth is it’s pretty hard to mess it up. If you use a little less oil and saute the grains a bit longer, stirring occasionally, you can achieve a nice toasty flavor, too. It’s good to have options. If you’ve spent some time cooking, you’ll recognize the above as the makings of a mirepoix, used as a base traditionally for soups or sauces. 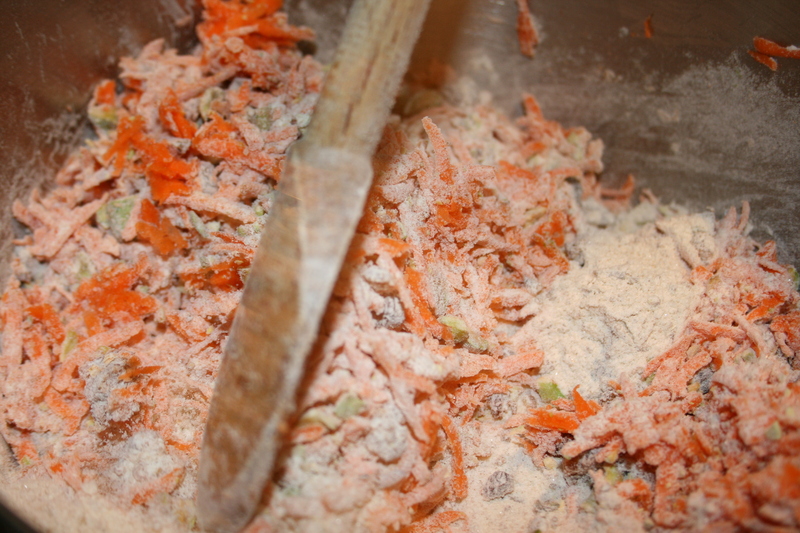 Mirepoix is kind of interesting in itself, but I’ll go more into that in a separate post. It’s meant to be gently sauteed. If you are keeping this a side dish, you basically just saute the veggies in olive oil until tender, toss in as much bulgur as you please, salt and pepper to taste, and you’re done! This is also a great place to toss in any leftover tidbits of meat or other veggies from your fridge. In this case I had leftover chicken and cauliflower which I tossed in last. This was enough to take this baby from side dish to main dish – and then main dish in the morning again with the addition of over easy eggs. I like a meal that does that much work. Oh, man. Hi there! It’s been a while! Turns out having a child takes up a lot of TIME…who knew?? But I had to eke out just a minute here to share this go-to tortilla recipe, because if you haven’t looked at the back of your store bought tortilla package today, you’ll need to get yourself a magnifying glass and a half an hour just to read the ingredients – and that’s the ones from the health food store! Needless to say, with a focus on simple and wholesome foods, there isn’t really a place for store bought tortillas. 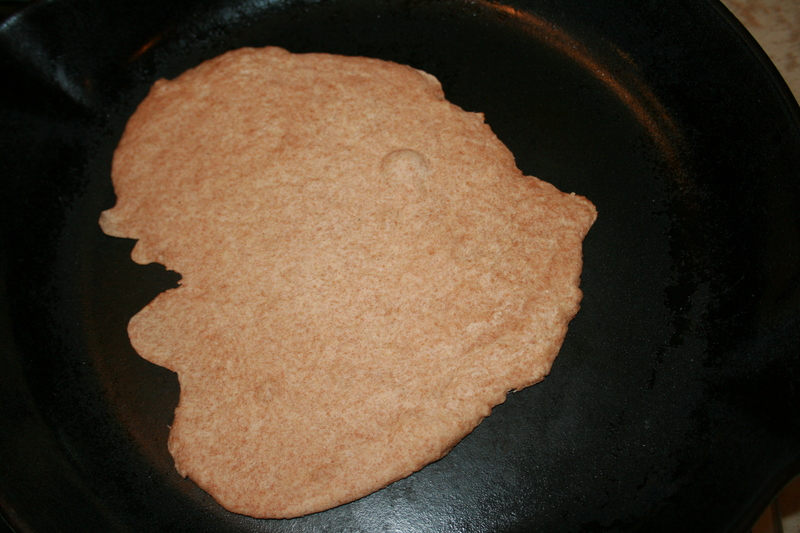 Enter the soaked whole wheat tortilla. I have to give most of the credit for this recipe to MAM (Modern Alternative Mama) a place to find lots of good and healthful recipes. However, I did tweak the recipe enough to feel that it warranted it’s own post. I just went with a whole wheat flour, as opposed to white whole wheat, but it’s what I had. And I have found the whole wheat flour to have a slightly richer flavor that I appreciate. I reduced the amount of salt, increased the coconut oil and water both, because I didn’t want to work as hard as she described rolling out a really stiff dough (read: I’m lazy, and I’m ok with that). 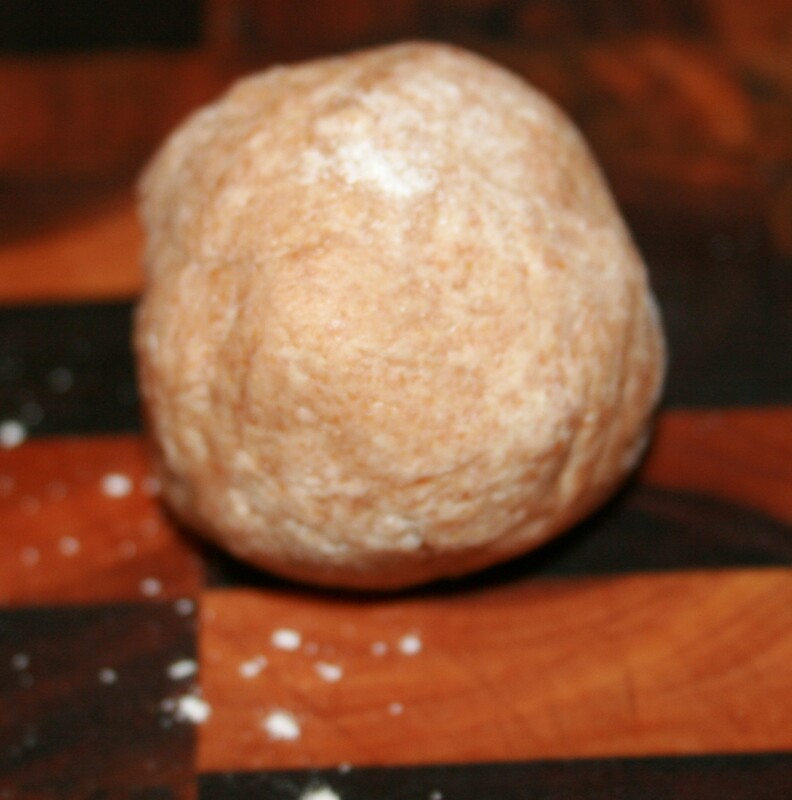 The night before you think you will have time to roll out a bunch of dough and fry it up (and sometimes you are wrong, especially when you have kids, but that’s ok, I’ve left the wet dough, covered, up to a couple days..just makes it richer tasting, right?? ): melt your coconut oil and mix with flour and water until it all comes together (this may require a little hand kneading). Cover with plastic wrap and let sit out on the counter, or wherever you have room, over night. Soaking helps to make the flour and its nutrients more accessible to your body and I’ve read, both on the MAM site, and other places that whole wheat flour doesn’t necessarily require an additional acid to help break it down – if you are really passionate about soaking grains, I’m sure you could add some lemon juice, whey or keiffer to help it along, but you may taste it in your tortilla. I haven’t tried it! When it comes time to add the salt and baking powder, this is another place I diverge from MAM. Instead of trying to stab the hard dough into chunks with a metal spoon, and then somehow mix the salt and baking powder into it (and hey, don’t get me wrong, if you are feeling angry this can be a very effective release), I mix the two dry ingredients into a little bowl. I sprinkle a little of the mixture onto the surface I am going to knead on, place the dough on top and then sprinkle a little on top of the dough as well. While I am kneading, I keep sprinkling it until it’s all gone. This saves me from adding too much flour, as I think keeping it a little on the moist side helps when you are rolling it out. Come on, baby, ROLL me! Ok, and here’s where things really start to get rollin’ (I couldn’t resist). I sprinkle the tiniest but of flour onto the ball, but leave it tacky, as that is how you are going to get these babies FLAT. As I roll, and you DO have to use a little pressure – consider it your weight-lifting routine – I flip the tortilla over and back a few times, so it doesn’t get too ground into the cutting board. Once it’s as flat as you can get it, or as flat as you have time/motivation for, throw that baby in the pan! Cook for a minute or so on each side, you want the bubbles to pop up and some light browning to be happening. This one looks like an old lady with a pointy nose on a motorcycle, with her hair flying back, do you see it?? Like I was saying, perfection is not the goal here, people, yum-yums are! Let the hot tortillas cool on a rack. When they are totally cooled, I split them into two large baggies and freeze some, when I pretend that it will take that long before we eat them. You can eat just about anything with a tortilla, and my little one usually demands the first one that I’ve made, once it cools a bit. 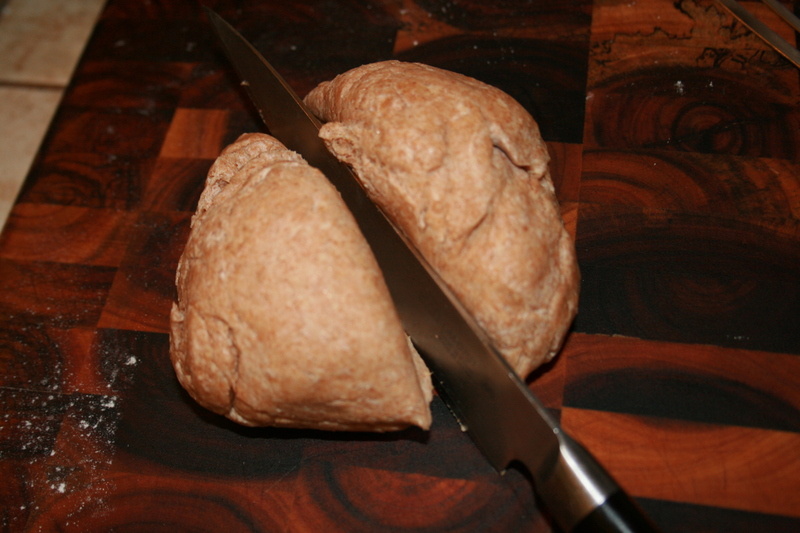 Happy Tortilla making, and may you never buy store-tortillas again! I’m sad. Nobody loves me. Quick note: I don’t have a problem with a good cheese sauce. However, if you haven’t tried just chopping up a head of cauliflower into even bite-sized bits, sprinkling with a little olive oil and salt and then broiling it until it caramelizes, you seriously don’t know what you are missing. It’s like BUDDA, baby. 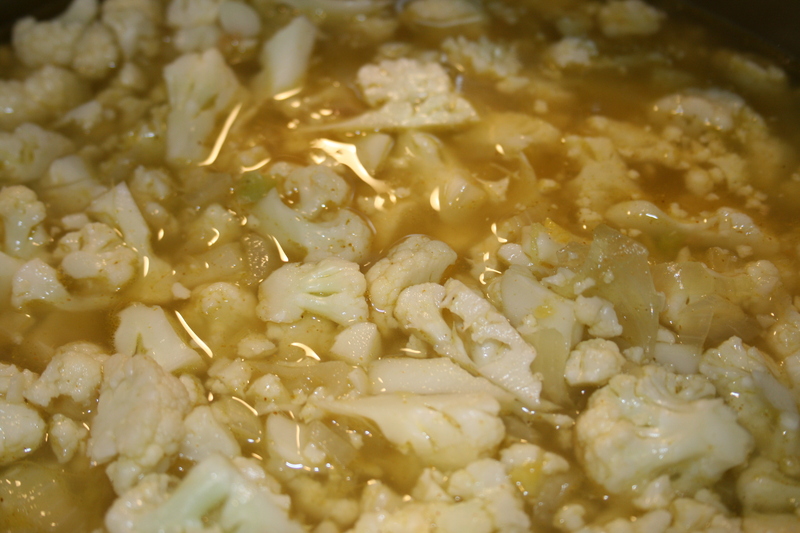 Cauliflower has a lot to offer in addition to it’s lovely flavor, when cooked correctly. It is considered a nutrient dense food because it is low in fat, but high in fiber, folate, and vitamin C, in addition to several phytonutrients that are believed to help protect against cancer and aid in DNA repair. So get ready to get your cauliflower on! This recipe was initially inspired by a recipe in a magazine that turned out to be more like an evil step-sister. The picture looked really pretty, but when I started to read the directions, like just boiling the cauliflower in water forever (ick, overcooked, taking away nutrients AND flavor) and also didn’t call for the entire head of cauliflower (what am I supposed to do with the rest?) Not that I couldn’t find something to do with it, but if I’m going to make a soup, I’d just rather use the whole cauliflower, you know? So, pretty on the outside, ugly on the inside, this an evil step-sister makes. I kept a few things, like, the cauliflower, the coconut milk and the curry spices. The rest is just soup-making basics. So let’s get to it. The other nice thing about this recipe is that it’s fairly simple. I like simple. And so does cauliflower. It doesn’t take a lot to make it taste good. Chop your onion and throw it in your warmed soup pot with some olive oil and saute until just soft. While the onion is softening, chop your garlic and your ginger. When the onion is ready, toss in your garlic and ginger and saute until you can just smell them, maybe a minute or so. Then throw in your three cups of stock. 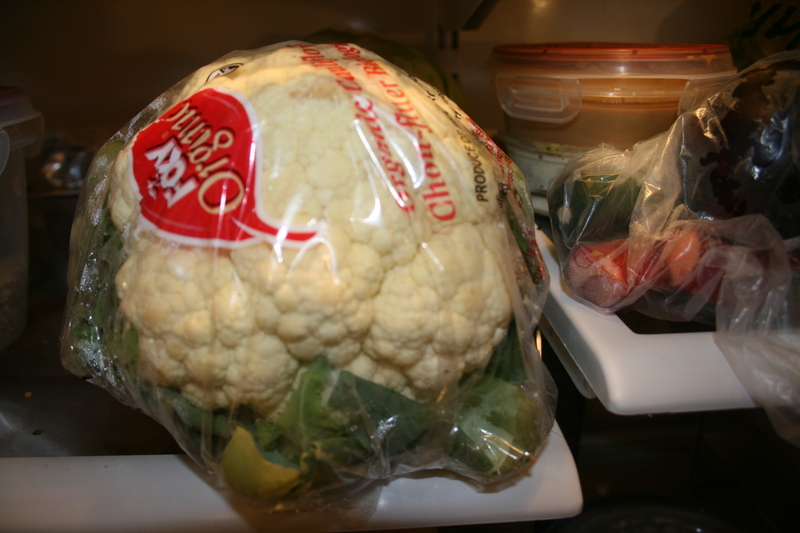 Chop up your head of cauliflower. I find it is easier to start by removing the stalk so you get the pesky green leaves out of the way. They are a little tough and hard to get around. Then you can set your cauliflower head flat side down on the cutting board and get to business. Add this to the pot, along with the curry powder. like fluffy little clouds, in a chicken stock sky..
Bring to a boil, then simmer for about ten minutes, or until the cauliflower is tender. While the soup is simmering away, get out your coconut milk. You’ll want to give it a stir since it separates in the can. 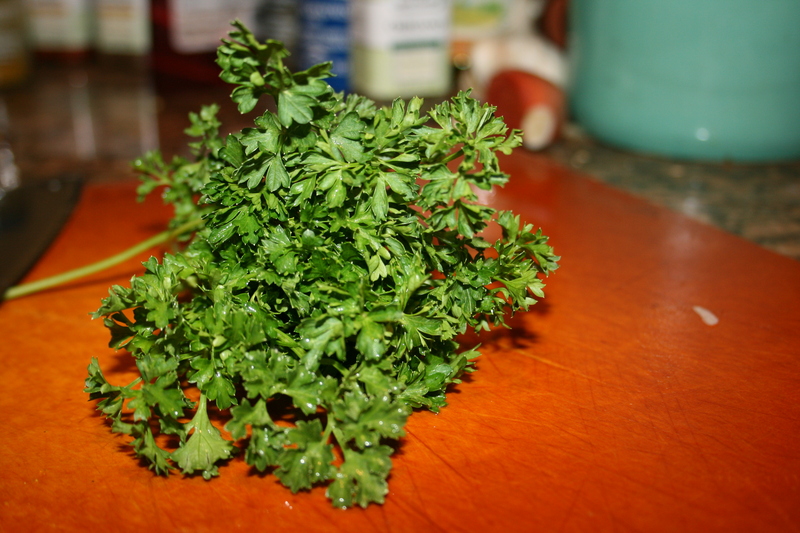 You could also take this moment to chop up your parsley. I’m so fresh and so green! And may I just take a moment, since the soup is still boiling, to elaborate on the wonderful world of parsley? It has also been found to have anti-cancer benefits by inhibiting the formation of blood vessels that feed a tumor, helps to excrete sodium while increasing the absorption of potassium, is antimicrobial and is also a rich source of phytochemicals, like carotenoids, which are antioxidant and anti-inflammatory. Ok, done. That soup is probably about ready! Pour in your mixed up coconut milk and get ready to blend. The next step, for me, includes an immersion blender. I had an ‘incident’ with a regular blender and hot soup a couple years ago, and I just don’t go there anymore. But if that’s what you’ve got, just proceed with caution and in SMALL batches. Don’t let impatience get the best of you. Believe you me! Once you have achieved the desired consistency, add your salt and pepper to your own liking and serve it up. If you desire a little more curry punch here, don’t be afraid to add a little more. Soup is good that way. It takes to tweaking pretty well. A nice dappling of green to finish it off! 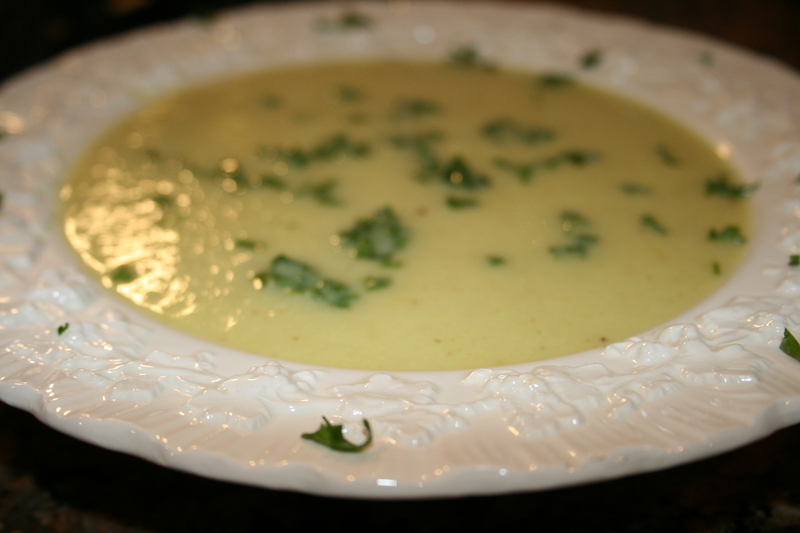 This soup has a delicate sweetness to it with a satisfying and rich finish. It would probably be delicious hot or cold..although we didn’t have enough left over to test out the cold hypothesis…oops! Maybe next time. I love carrots just as much as the next person. They are particularly delightful to dip into hummus, along with fresh bell peppers. 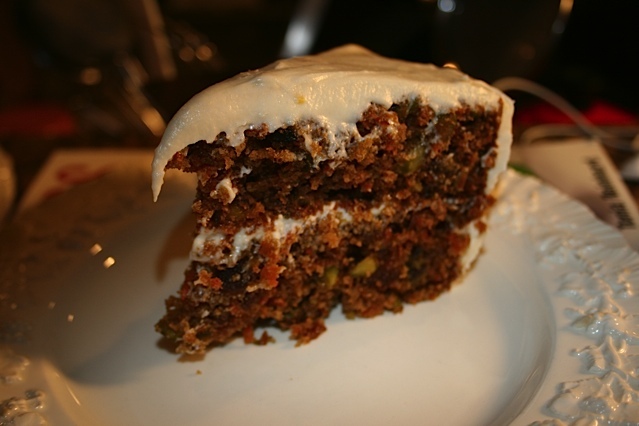 However, I would say hands down my favorite way to load up on all the beta carotene, fiber, antioxidants and minerals in these crunchy taproots would be via the delicious vehicle that IS carrot cake. 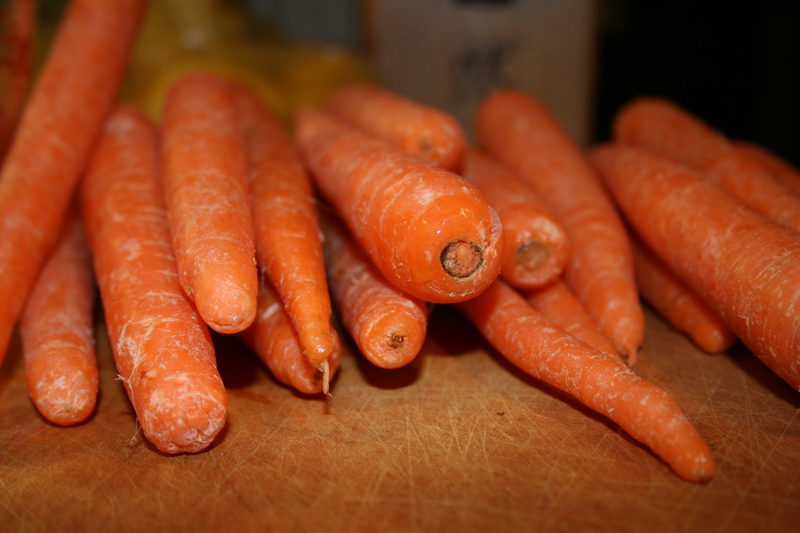 And what’s all the better is that a cooked carrot provides more of these nutrients than an uncooked carrot. So really, you’re just bringing out the best in this yummy veggie. And who could fault you for that? This recipes is particularly delicious because it’s filled with carrot, dried apricots, and pistachios and you could probably leave it out for several days and it would not become dry. We sort of tried this by default. This may sound disturbing at first, but really it’s a function of the olive oil content..which is ALSO good for you. So this is BASICALLY a health food snack…at least, until you add the frosting..but who’s counting? In moments like these I like to think of Mitch Hedberg‘s great joke about an onion ring and a carrot – he said he wished when they both got into his stomach the carrot could say “It’s cool, he’s with me.” So, we’ll just let the carrots do the talking for the frosting and call it good. Geez. I just have to say right now that it’s been a couple months since I made this fine cake, and even though I JUST made a batch of Orangette’s AMAZING whole wheat chocolate chip cookies, I am thinking of giving them all away so I can make this one again. My mouth is literally watering. Ok, now that I got that off my chest, and now that you are familiar with the long list of cake ingredients (I promise it’s WORTH it) I realize I forgot to tell you the bonus to this recipe…there is enough for 8-12 cupcakes in addition to the two layers of cake. So you know when you bake a cake and you really want to try it, but you can’t break into it until you bring it to whomever? 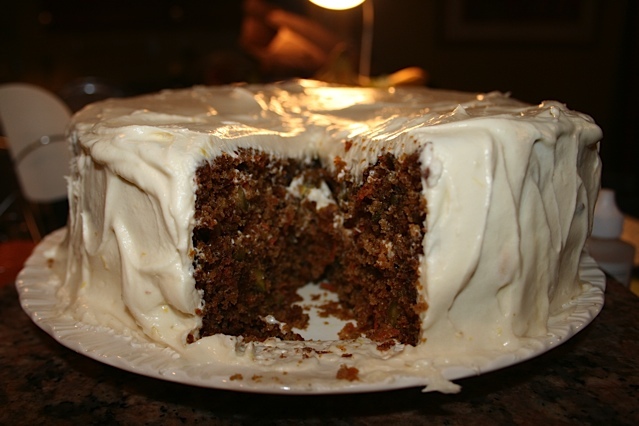 Well, fear not, my friend, because you can guiltlessly gobble down your own private carrot cake party, experimenting with butter spreads (yummy!) and maybe a dip or two into that cream cheese frosting. Because, you know, you HAVE to make sure it isn’t poisonous, right? Ok, ok, it’s been a while, so I’m blabbing, let’s get to the baking! Preheat your oven to 350 degrees F. Butter or spray two 8-inch round cake pans and an 8 or 12 cup muffin pan (you’ll have to keep an eye on the littler ones while baking) and set them aside. 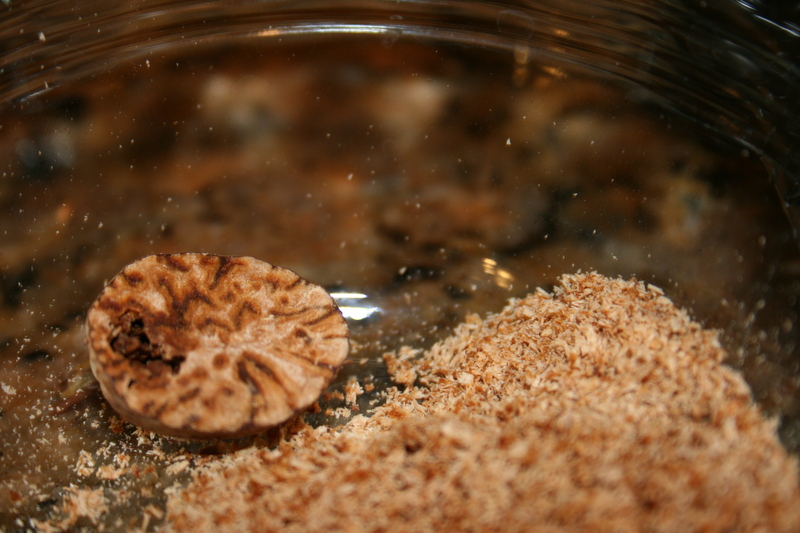 If you are using fresh nutmeg, now would be a good time to grind it down. 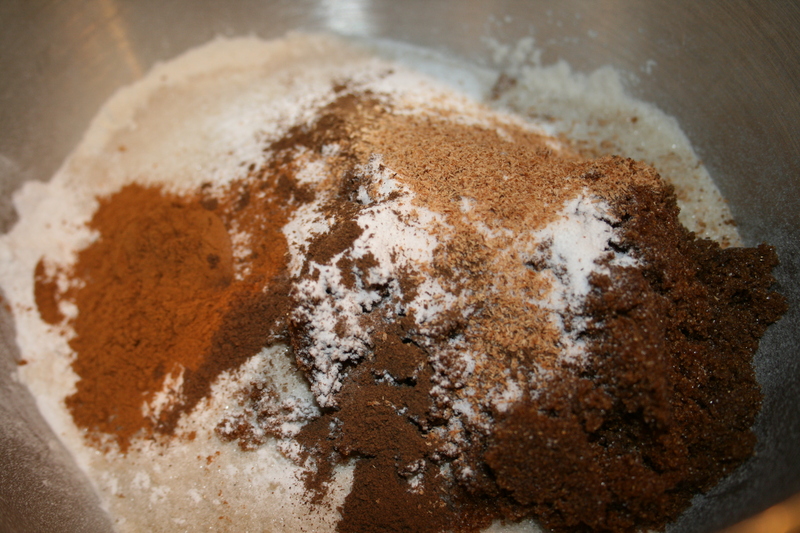 Like I said with the cinnamon, and especially because fresh nutmeg has a more delicate aroma than pre-ground nutmeg, don’t be afraid to sprinkle a little extra in there! such a yummy little nut..
Next, combine the flour, sugars, baking soda, baking powder, salt, cinnamon, nutmeg, and allspice in a large bowl. The note about the cinnamon is just that I, personally, like a little spiciness to my carrot cake and for some reason the 1 and 1/2 teaspoons didn’t seem like enough, the cinnamon-iness was more subtle than I prefer, so up the ante if you’re like me. 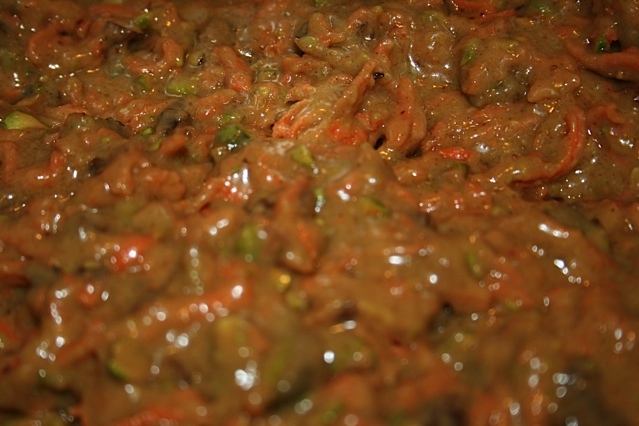 If you like it more mild, just follow the main recipe. Whisk the dry ingredients to combine. it’s like an abstract painting…I’m feelin’ it..
Next, you’ll want to chop up your pistachios and dried apricots and grate your carrot any way you please. I like the bigger, traditional flakes, so you get a nice little burst of carrot flavor. Toss all these into the flour mixture and mix them up, making sure the little bits of apricot get a nice coating of flour so they don’t end up in a big clump. 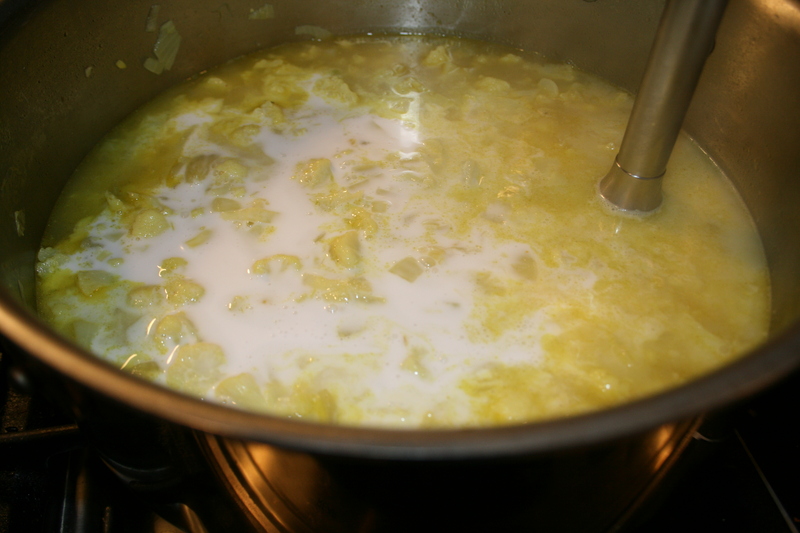 Grab a medium bowl and add the four eggs, olive oil, milk and vanilla and whisk until combined. it’s like moisturizer for your cake! 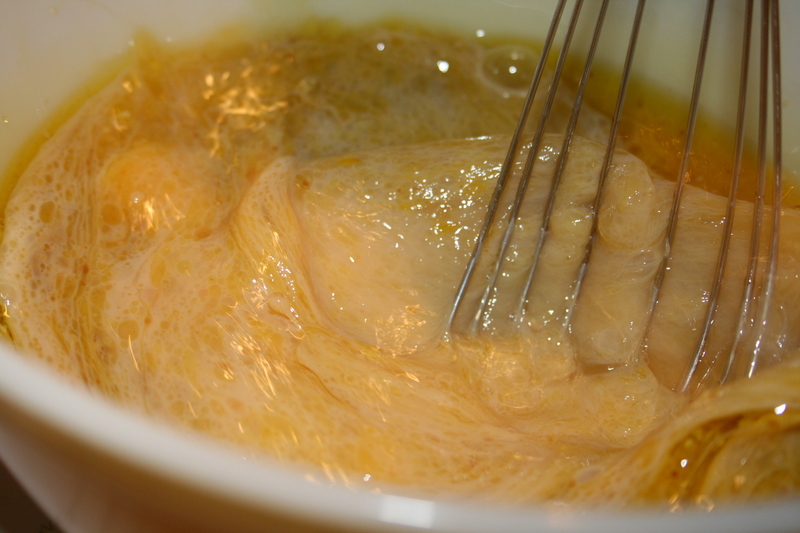 Add the wet ingredients to the large bowl of dry and stir until just combined. 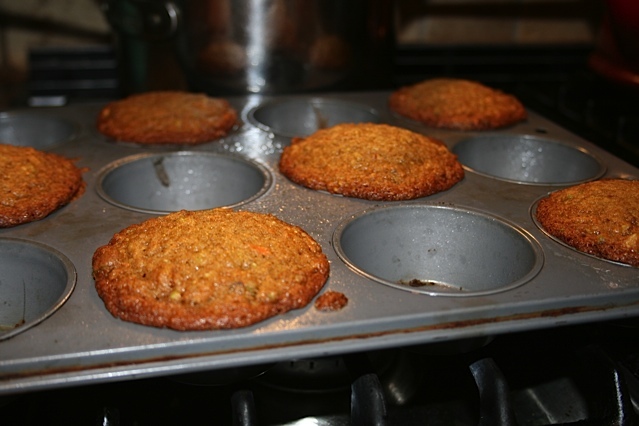 Now you are ready to distribute the batter, 3 cups into each cake pan and about 1/4 cup per muffin tin. Mostly you want to make sure the muffins look even, whether you decide to eyeball it or go with the measuring cup. Bake the cakes until you can poke ’em with a toothpick and have it come out clean. This is about 40 minutes for the cakes and 20 minutes for the cupcakes. Cool cakes in the pans on a wire rack for 20 minutes. 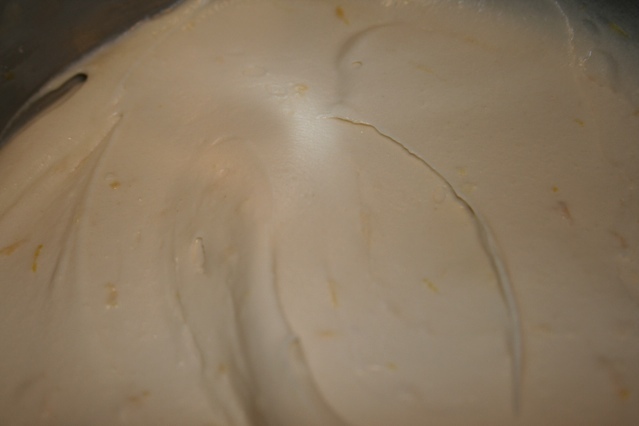 If you are planning to move directly to the frosting, it’s probably a good idea to take the cream cheese out of the fridge when you pull the cakes from the oven, so it can reach room temperature. Then remove the cakes and cupcakes from the pans and allow to cool completely. The great thing is, that even if you leave these cakes out overnight or during the day, even just loosely wrapped in saran wrap, they are STILL crazy moist and delicious. So don’t worry if you can’t do it all at once, you will still have a scrumptious cake. Put the powdered sugar, cream cheese, butter, vanilla, lemon zest (and lemon juice if you like a little extra tang) into a large bowl or a stand mixer bowl. Mix them up until smooth and creamy. Then spread this yummy frosting on your cake or cupcakes, or whatever you well please. Happy Baking! Hope you enjoy!